Cheap ATV Tires Buyer's Guide - Find Out Which Brands Are the Best Value! Cheap ATV Tires - Buyer's Guide. Best value brands and where to find the best deals! Looking for cheap ATV tires? You've come to the right place. We decided it was time for us to do something about the economy - By helping you find the best deal possible on value brand ATV tires. We not only wanted to find tires at the best prices, but from sellers with the best online reputations. It's not that hard to find cheap tires, but many times the suppliers just don't seem very reliable. That can lead to a bad experience and even worse - spending more money than you could have bought the same tire for from a reputable dealer. So the links below will take you to suppliers with both the best prices and excellent customer ratings. And we think that's the best way to really save money on ATV tires. AMS - Value priced tire from mega-distributor Parts Unlimited. Carlisle - Specialty tire manufacturer that's big in the industrial and agri markets. Most or their ATV tire line is aimed at the utility segment. Cheng Shin cheap ATV tires - Chinese tire maker that's been in the dirt bike market for many years. Known for inexpensive, long wearing tires. They also make several other ATV tires by other brand names. CST - Made by Cheng Shin. Popular for being a pretty good tire at a real value price. They have a complete line of ATV tires now. Dunlop - The OEM tire on most popular ATV brands. Duro - Offers current tread designs like more expensive tires but at value prices. GBC - Used to be known as Greenball. Also made by Cheng Shin. These tires are known for long wear and increased puncture resistance. More performance oriented than the CST brand. Interco - Big in the off road truck market. 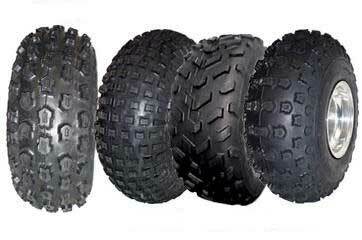 Offers some specialty ATV tires mainly for mud and sand. ITP - The largest aftermarket ATV tire maker with a tire for almost any situation. Kenda - One of the most popular aftermarket ATV tire makers. They have tires for just about any application. Maxxis - Another tire made by Cheng Shin. Well known for the Razr and Mudzilla models. Very popular on 4x4 utility ATVs. ATV Tire Facts - 5 things you need to know before your next tire purchase.